From Britain’s ‘master of horror’, Adam Nevill, comes The Ritual, winner of the August Derleth Award and perfect for fans of Stephen King. 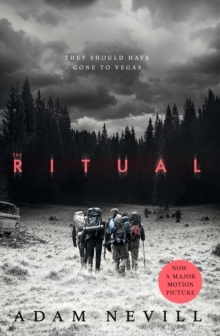 Now a major film with Rafe Spall.In Adam Nevill’s The Ritual, four old university friends reunite for a hiking trip in the Scandinavian wilderness of the Arctic Circle. No longer young men, they have little left in common and tensions rise as they struggle to connect. Frustrated and tired they take a shortcut that turns their hike into a nightmare that could cost them their lives. Lost, hungry and surrounded by forest untouched for millennia, they stumble across an isolated old house. Inside, they find the macabre remains of old rites and pagan sacrifices; ancient artefacts and unidentifiable bones. A place of dark ritual and home to a bestial presence that is still present in the ancient forest, and now they’re the prey. As the four friends struggle toward salvation they discover that death doesn’t come easy among these ancient trees . .